“Everyone should have had the chance to meet Alex. He was witty, charming and brave. We met in the midst of a difficult time for him. His health was failing. During our time together he tried to teach me Cockney Slang, we told lots of jokes and close to the end, discussed how to die. I was honoured to be with him as he left this world. After Alex’s passing, his dear wife Tina and I became friends. She told me about “tie quilts” and her thoughts about having one done for Alex. I told her I knew how to quilt. (Ha, little did I know what that comment would turn into…) After many conversations it was decided I would take on the project to make Alex’s quilt. First there was the task of finding a design to showcase the ties. Then the hours and hours deciding which ties to use and how to group them. Tina’s input was invaluable. The underlying thought was always Alex. What did he like? How would he want us to do this? I thought about Alex during the entire process. 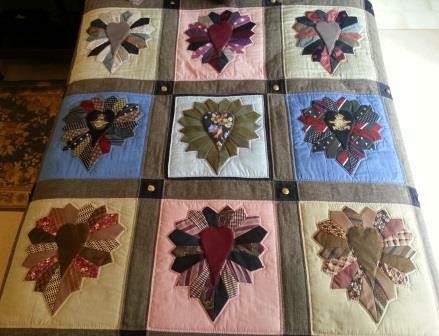 Next came the piecing and the quilting. All the different types of fabric made it a challenge. My fear of sewing machines led to every stitch being done by hand. I admit that my need for perfection meant many parts were sewed, taken apart, and sewed again. All the fabric except for the border and backing were from Alex’s wardrobe. Ties, jackets, shirts, cummerbunds and vests. The amazing crests and buttons… those came from his RAF blazer. The last recording of Alex’s singing was “The Bluebird of Happiness”, thus came the idea for the centre square and his bird tie.